Made from honey roasted peanuts, this small-batch peanut butter sampler includes six yummy blends. If you've ever caught yourself thinking, "Wow, peanut butter just couldn't get any better," while liberally spreading it over some perfectly warmed bread, you're dead wrong, my friend. Add chocolate chips, pretzels, toffee, popcorn, white chocolate, and more to the mix and you've got the type of peanut butter kid and adult dreams were made of. Made from honey roasted peanuts, this small batch assortment offers a crunchy/smooth texture hybrid that's chock full of sweet and salty additions. Spread on fresh bread, dip with apples, or just enjoy with a spoon—we'll be doing the same. Handmade by Jon Weed in Zionsville, Indiana. Visit the Blog to see some of our favorite recipes featuring the Peanut Butter Sampler! Many culinary empires begin with a recipe. Kathy Weed’s began with a lesson—her artisanal peanut butter was a way to teach her children about running a small business. The endeavor, which she jokingly terms "a lemonade stand on steroids," has since expanded well beyond the weekend farmer’s market. "I love to envision people eating a jar with a spoon," she says, "and thinking that they are in their happy place." This is a perfect gift for The peanut butter / Reese's lover in your life. This was a birthday gift for my brother, and in his words peanut butter "is his jam". He was smitten with all of the different flavors! I got him a big bag of pretzels to go with it. And the next morning he said he had one of the pb's on his toast for breakfast. This is a winner! Thank you! I bought this sampler box to actually sample prior to sending to my big brother in Florida for his birthday in May. Who wouldn't love a box of gourmet peanut butter? So far, I'll be ordering one for him and one for me - two for him and three for me! These are amazing combinations of really delicious ingredients. I've never eater spoonfuls of peanut butter, but it's really hard to STOP eating these. When I received my order I was disappointed to see that there is corn syrup and artificial flavor in the ingredients. Small batch goods usually have premium ingredients, so I wasn't expecting corn syrup and artificial flavors. The ingredients listed on the site are misleading and don't include everything. I can't eat corn so I won't be able to enjoy these products. Also, like many other reviewers, a couple of my jars had oil leak out. This was initially a gift for me. I enjoyed it so much I gave it to my Dad for his birthday. He was just as excited as I was. 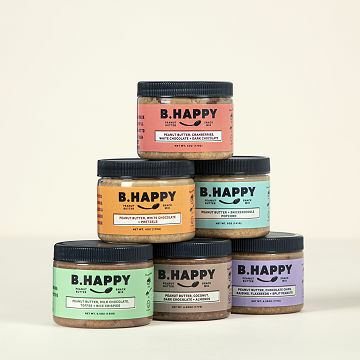 The 6 jars of peanut butter with different flavors is a unique and delicious gift. The jars do not need to be refrigerated after opening. You do have to stir the oil which can be a pain but it's worth it. The flavors are all wonderful and each jar is a treat. They are small but large enough to share. Grab a spoon! Would definitely buy it again, and again! This was a gift and was a totally unexpected surprise. My husband and I have enjoyed all the flavors we've tried. We have a few left to try. As it's a small container, it's easy to share or bring to work in your lunch bag. The variety of flavors is the best part. Can eat the peanut butter straight from the container, put it in oatmeal, on a warm biscuit or put on celery. It's all delicious.. Some flavors have to be stirred more than others to mix the oil in. Does not have to be refrigerated after opening. Highly recommended.